SECAUCUS, NJ – Mayor Michael J. Gonnelli and the Town Council are happy to inform you that a blue line has been painted along Paterson Plank Road beginning at Maple Street, in front of the Secaucus Public Library (where this photo was taken) and finally ending at John Street. “The blue line is our way of saying thank you to our police department for responding to emergencies quickly and professionally,” says Mayor Gonnelli, after seeing the praise it’s received so far. 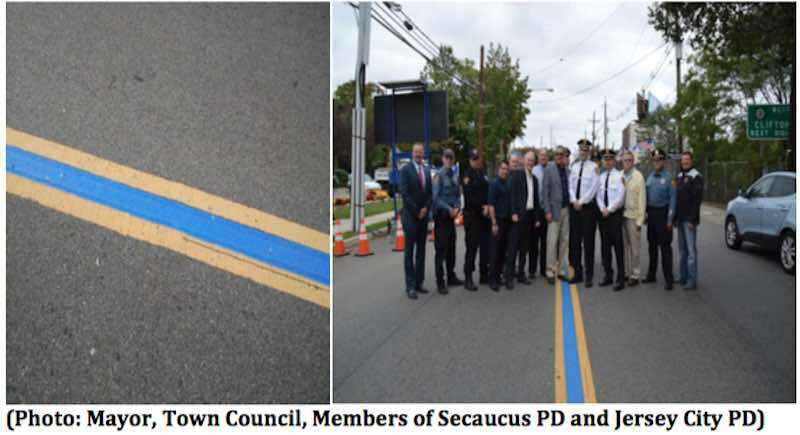 Secaucus residents reached out to Mayor Gonnelli after seeing neighboring towns painting blue lines on their streets. These blue lines have been popping up in towns across the nation as symbols of support and gratitude for the policemen and women who put their lives on the line each day. Secaucus supports the police officers that keep our Town friends and families safe.